Last summer the New Horizons spacecraft whizzed by Pluto, capturing stunning images of canyons, ice mountains, and moons. Now, New Scientist reports that in unreleased emails, NASA researchers suggest that individual clouds might be hovering above the dwarf planet's surface. 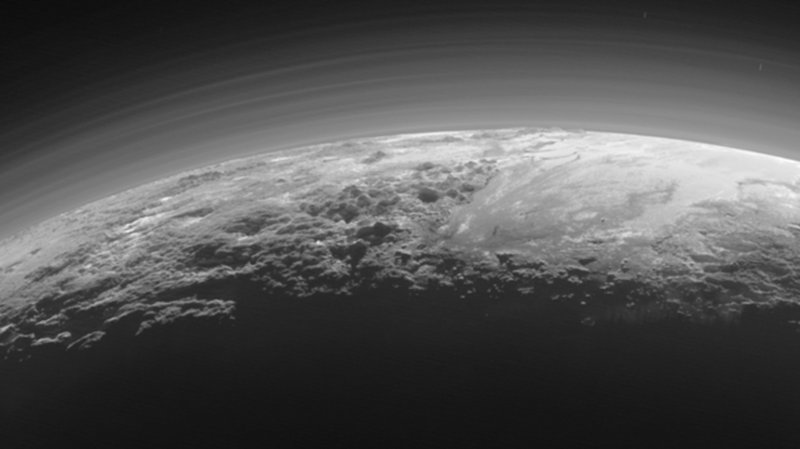 NASA has previously shared shots showing layers of haze stretching above Pluto’s ice-capped peaks. These images hinted that Pluto’s atmosphere was more complex than we’d previously known, New Scientist says. In September 2015, however, scientists noticed "cloud-like" figures in one image. It was hard to tell whether they cast shadows, so the jury was still out as to their exact nature. Then just days ago on March 1, John Spencer, a scientist with the Southwest Research Institute, sent an email to the team with a picture from the New Horizons mission attached. In it he wrote, “In the first image an extremely bright low altitude limb haze above south-east Sputnik on the left, and a discrete fuzzy cloud seen against the sunlit surface above Krun Macula (I think) on the right." NASA has stayed mum on their findings, and only briefly mentions the possibility of clouds in a forthcoming paper for the journal Science called “The Atmosphere of Pluto as Observed by New Horizons.” These tantalizing images are likely extremely new, and since it takes a while for the probe to transmit data back to Earth, space lovers and scientists alike probably won’t know the true nature of the mysterious fuzzy spots for quite some time. To see more images of these potential clouds, check out New Scientist's full article.